Kawasaki Versys 650 is a bike not like other tourer, it is unique in its kind thereby giving answers to the growing demands of Indian touring brotherhood. This particular brand of Versys makes a lot of sense for India’s community which brought great recognition to the Versys brand. In a market like that of India’s, where everyone turns up owning a bike, versatility is the key to any motorcycle. A good bike in such a place as to adapt to a lot of requirements and the Versys 650 checks almost, if not all the right boxes. It’s ease to take you from one place to the next makes it a suitable and comfortable daily bike, that’s your Monday to Sunday commute . From first sight, the bike looks intimidating but once you swing your legs over and are in motion, the bike feels like any quarter litre bike being just taller. The tall and wide handlebar enables great control. The lowered and centered rider foot pegs aid comfort, the seat is well cushioned, suitable and it is not exactly soft. It has a great combo for long distance riding. It is also beautifully easy riding the Versys 650 around the traffic; this is without the panniers because with panniers on judgement could be a problem. It is a great bike to munch on miles and it is formidable fun in the twisty as well. Being on the Versys 650 you feel stable, light and sure-footed around corners even the tighter ones. So all you are doing is giving the one-piece handlebar a slight push and the Versys changes direction as if that was its purpose. The bike is very communicative ensuring you have a great ride on it. The long suspension soaks up the bumps and bad roads really well. And even if you manage to ride it through a really bad pothole, the bike takes it without drama. It’s a very impressive bike, having new calipers, grippy low dunlops, a large disc at the rear and ABS making Versys 650 a safe bet. Versys 650 engine is the same 649cc proven engine from Kawasaki. This produces 68bhp at 8500rpm and 64Nm at 7000rpm. The nature of the bike favors a lot of low and mid-range torque. It has dual 38mm throttle bodies, making the throttle response crispy. So twisting the throttle and the sudden surge of power is going to put a smile on your face. The six-speed gearbox is smooth and offers precis shifts. 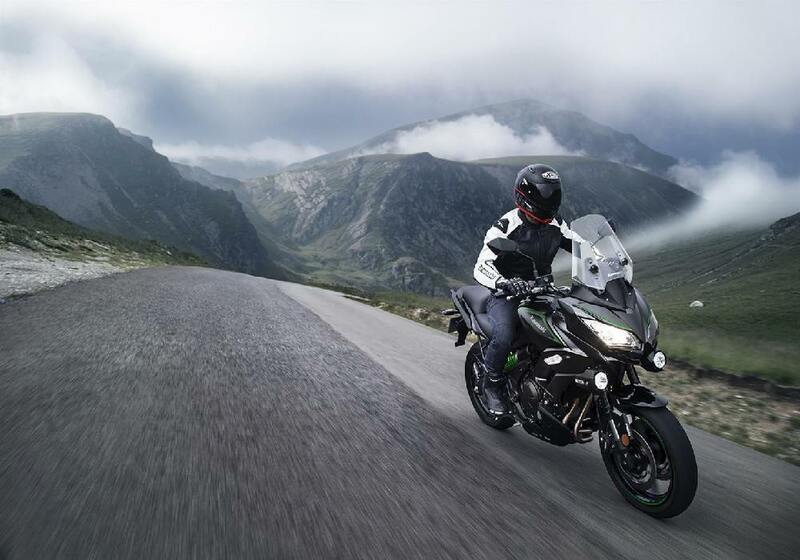 The previous band of Versys was not famous for its design but Kawasaki sorted that out with the new bike which is not just pleasing, it is actually good looking. It has a striking look like that of a great warrior. Its twin headlights work well in the dark, its large windscreen is manually adjustable and it has an excellent, in fact a top notch fit and finish. At its front it has a 41mm upside-down Showa units with Separate Function Forks (SFF). The left leg takes care of the preload adjust-ability, while the right takes care of rebound. The instrument cluster of the Versys 650 looks somewhat similar to the one on the ninja 650. The upper section takes care of the tachometer and the small LCD display control the lower section. This screen displays the fuel level, speed, odo reading, instantaneous fuel efficiency and the average fuel economy as well. Its two dummy round plastics on the extreme ends of the cluster looks little out of place but they are used in the LT version for a power outlet and gearshift indicator. You also need to know that it has placement for panniers through Kawasaki Quick Release (KQR). These panniers have a cost of Rs 80,000. By the way if you are wondering if the Versys 650 is as tall as the Versys 1000, your answer is yes, but its light weight makes it more easy. ( 2018 Kawasaki Ninja 1000 Review ). The Versys 650 is a nice bike, good looking and comfortable for touring. It can also work well as a daily commute. Its rather expensive as compared to the ninja 650 which cost Rs 5.37 lakh but the additional Rs 1.23 lakh you pay for a Versys 650 is not in vain, it’s worth it. It’s a more serious touring bike with ABS, better suspension setup and comfortable seating ergonomics.